Namwon City's Kim Byungjong Art Museum will start presenting a series of exhibitions on a theme of ‘Multidisciplinary Art’ this year. This series will mainly introduce artists, who explore various genres of art while delving into its origins. It aims to showcase their qualified artworks, which are produced by the artist’s deep insights into diverse artistic genres. 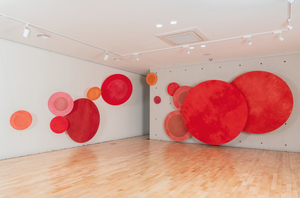 The artist of this year is Nakyong Lee, who has been painting with self-produced natural dyes from her studio in Namwon and creating textile installation and stage costumes with dyed fabrics since 2003. 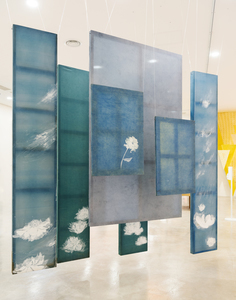 Her paintings seem rough but pure, and the colors used in her installation works symbolize nature. Her stage costumes make soft and lively movements on the stage as if they were about to fly, jump, gather, and scatter themselves. All of these movements and images are essential components of Nakyong Lee’s paintings. Participating in various exhibitions worldwide and creating stage costumes and background, Lee has been constantly asking herself; ‘what is it that I finally encounter at the end of this creation process?’ In order to get the final answer to this self-imposing question, Lee interacts with various art genres such as painting, installation, stage art, and often Hanbok (Korean traditional costume) design. 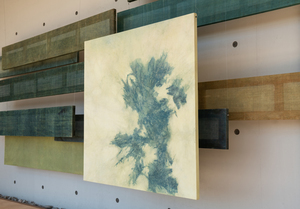 Through the exhibition, What is Waiting for Me, the artist clearly presents artworks inspired by Korean traditional five colors, which symbolize the spirit of Koreans embodying rain, ocean, mountains and flowers. 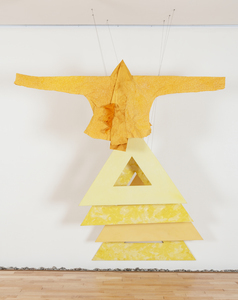 With the artworks stimulating viewer’s senses, Lee approaches a step closer to something that she would like to achieve at the end of her creative process. Silk, artificial silk, goldthread, turmeric, etc. Ramie fabric, hemp cloth, silk, goldthread, etc.